India, the melting pot of various religions, spiritual choices, cultures and traditions, is home to some of the most splendid temples ever built. You will certainly not fail to stumble upon a beautiful temple at any nook and corner of the country. Temples dedicated to all forms of all gods are spread throughout the country. Similarly, temples dedicated to Sun God can be found in a few places as well. 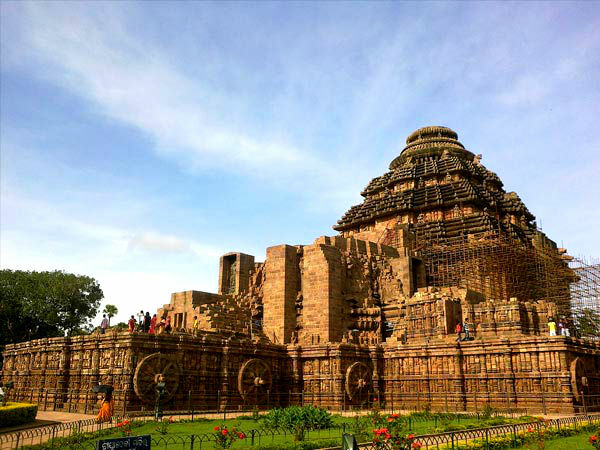 You might have heard of the Konark Sun Temple in Odisha, which is the most famous one of all. However how much do you know about these 5 beautiful sun temples located in other parts of our glorious country? Built in the 13th century, the most popular sun temple in India is located in Konark, Odisha. The temple's magnificence is recognised worldwide and was declared as a UNESCO World Heritage Site. The temple is situated 65 km from Bhubaneswar. Shaped as an enormous chariot with well-carved wheels, pillars and walls, the temple is believed to be built by the King Narasimha I. Formerly, the temple was settled on the banks of river Chandrabhaga, whose waterline has now receded. Since the temple faces east, the first rays of sun falls right onto the temple. Situated on the banks of river Pushpavathi, the Sun Temple at Modhera was built by the Chalukya dynasty under the rule of Bhima I in 1026 AD. The temple has exquisite carvings on the walls and pillars that reflect the beautiful architecture of the Chalukyas. The temple mainly has three segments to it. The shrine hall or Gudhamandapa, reservoir or Kunda and the assembly hall or Sabhamandapa. During the third week of January, an annual 3-day cultural festival is held in the temple premises called as "Uttarardh Mahotsav". Katarmal Sun Temple is located at a brilliant height of 2116 m above sea level, in the state of Uttarakhand. It is said to be built in the 9th century by the Katyuri King and the temple gloriously reflects the architectural style of their time. It is located about 19 km from the town of Almora. The image of Sun God found in this temple is believed to have been set up since the 12th century. Beautiful wooden doors and panels of the temple were transported to the national museum in Delhi. However the exquisite remnants can still be seen, which is protected under the ASI. Arasavalli Sun Temple or the Suryanarayana Temple is located in the beautiful state of Andhra Pradesh. It was built in the 7th century by the rulers of Kalinga dynasty. According to the inscriptions carved on the walls of this temple, the architect was King Devendra Sharma. The temple is located just 1 km from Srikakulam district, in the village of Arasavalli. Numerous festivals are celebrated in the temple, of which the Ratha Saptami is their most important one that is dedicated to the Sun God. Located in Jammu and Kashmir, Martand Sun Temple is a Kashmiri Hindu temple that was built in the 8th century. Although in ruins, you can see the beautiful architecture of the Karkota dynasty through its rustic remnants. Visiting Martand Sun Temple will give you a breathtaking panoramic view of the Kashmir Valley, since it is settled on top of a green, beautiful plateau. The architecture reflects a fine blend of many styles like Gupta, Chinese, Greek, Roman and more, which join to form the classic Kashmiri style of architecture.